Sunny and temps in the 40's drew me out where I planted 4 rows of carrots, cosmic purple, scarlet Nantes, and a rainbow mix in the lower raised bed. Husband planted Pal Choi and Toy Choy in tall raised bed. Used up some older seed (fingers crossed for successful germination) and planted Scotch Blue Kale, collards, Bright Lights Chard, and Japanese Giant Red Mustard in the bed that was once the floor of the chicken house. Picked and washed 3 gallons of spinach, will sautee with garlic later. Right now I am wiped out but in a satisfying way. Rain forecast tomorrow which would be sweet. Harold was no help preferring to meditate instead. Yum! We just finished off a couple pounds of fresh spinach. Nothing better. You are hardy. I won't plant until we are in solid 50's at night. 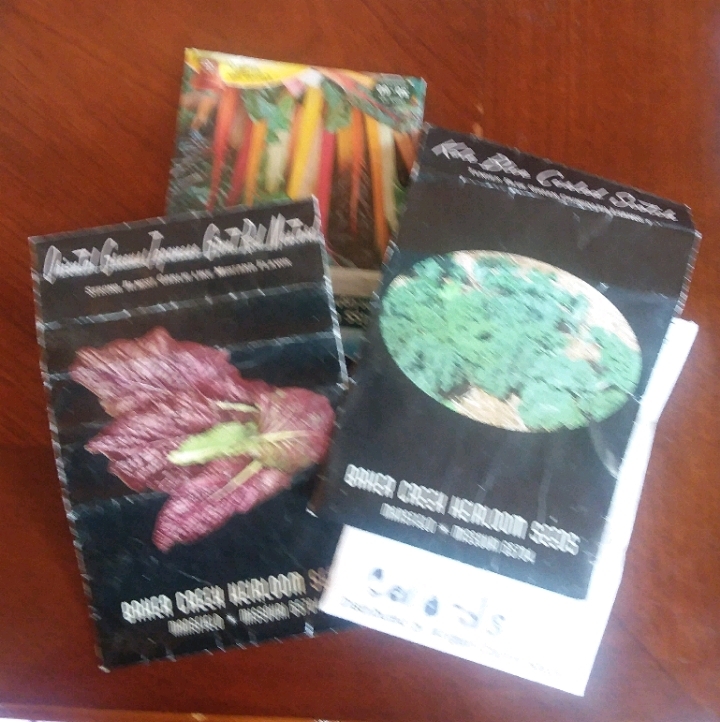 The husband is always anxious to get started and has lost some plants to late frost. That cat picture looks odd to me. I guess cause the red cushion reads as a bean bag chair to me so I think the cat is super huge. Optical illusion! I'm looking forward to getting some of your warmer weather. That's funny. 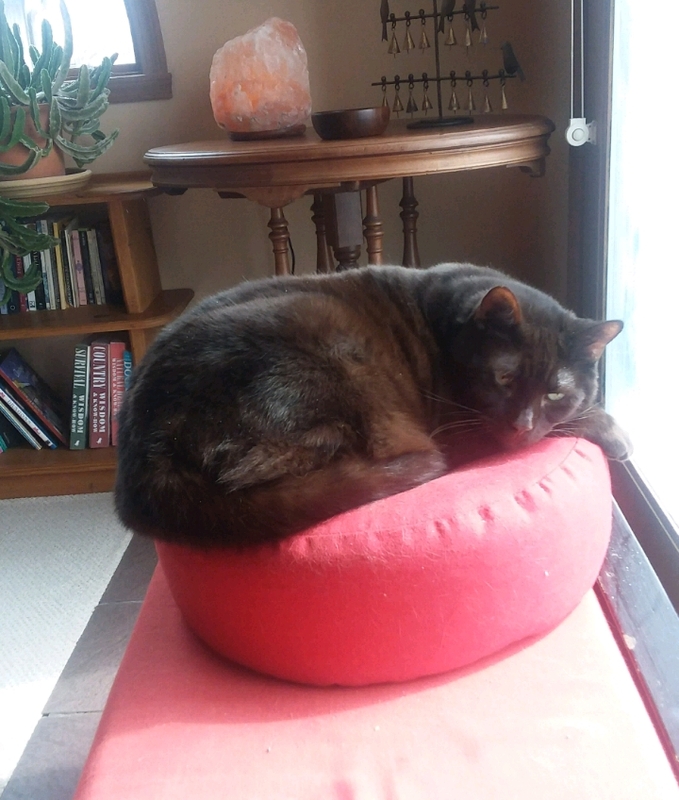 Lately he has stolen my meditation cushion, would be cool if he were really that big until I had to clean the cat box lol. Harold and I are of similar minds today. In my next life I want to be a cat. Sunshine and a nice cushion... Yeah, I'm with Harold on that one. Harold has life figured out. LOL, as I scrolled down, I read "Harold was no help, preferring to meditate instead" and then saw the orange or pink-looking rock at the top of the picture and thought, "Hmm, a meditating rock? Interesting." Well L, I'm going to have a talk with Harold just in case lol. He does seem to think he owns the world and everyone in it, but mostly he owns me. wow you got a lot do9jne. And sunshine just sounds perfect right now~! Sunny! Yeah! And you've been busy taking advantage of it. And rain on your new seeds would be perfect! I love Harold too, he has life figured out. He gets fed, someone carries hid poop outside and all he does is sleep. Fingers crossed fr your seeds. Seeds need sun, maybe in the next few days.